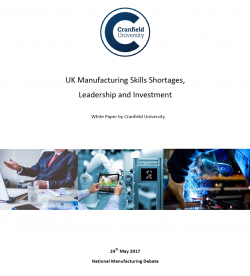 New analysis by Cranfield University has revealed key skills shortages within manufacturing. The University’s report highlights that leadership, innovation and management are all non-technical skills, frequently cited as lacking within the manufacturing sector. The report released at the National Manufacturing Debate also reveals shortages of technical skills in the areas of robotics and artificial intelligence, software skills, data analysis and electronic and electrical engineering. The information was gathered by the University after a systematic review and analysis of over 350 reports from Government, trade NGOs (Non-Governmental Organisations) and the media. Analysis of the reports from Government and trade NGOs, such as EEF, reveal that 62% of reports mentioned a shortage of skills in robotics and artificial intelligence, 55% reveal a shortage of data analysis skills and 46% reveal a shortage of innovative skills. • UK manufacturing has an ageing workforce which needs replacements quickly. Analysis has also revealed that responsibility for addressing the skills shortage is not clearly defined, with employers looking to Government and Government looking to employers to address the issue. The report’s contents were discussed at the eighth, annual National Manufacturing Debate hosted by Cranfield University. “This analysis shows that the sector faces some key challenges in skills development that will have long-term implications for manufacturing productivity in the UK. Our report also highlights a lack of clarity as to who is responsible for tackling this skills deficit with employers looking to Government and the Government looking to employers. “All of us involved in manufacturing, industry, schools and universities, must work together, as a matter of urgency to address this critical skills shortage.